Next Sunday, March 13, Worship: Lamb & Hayward need the chapel on Sunday, March 13, so for this Sunday only we will meet for worship in the Papanui Hall at 10am. We will email this notice around during the week leading up to the 13th but please feel free to let people know. It is happening but this time with a little twist! 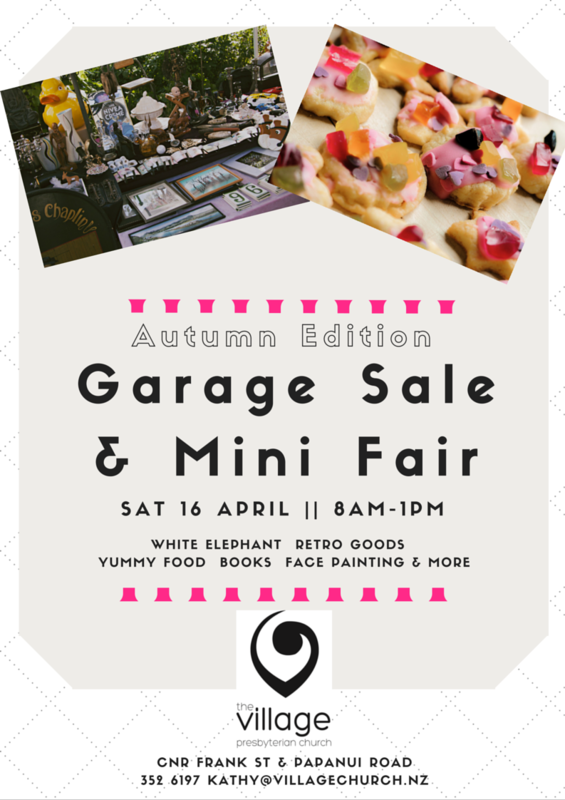 This year’s Autumn Garage Sale will also include a few fair type stalls and activities for kids and adults alike – it is going to be fun! Can you help us? We need volunteers for setup Friday, on the day Saturday, and final clean up on Monday – please let Dan know – dan@villagechurch.nz – as soon as possible and as usual we will be looking for donations of quality goods, jams, baked goods etc – more details to come on exactly what we are looking for. Thank you to all who so far have indicated they are available to help. We will be in contact soon. Put it in your diaries & spread the word! St Giles Indoor Bowls: This season we will be joining with Papanui Methodist Indoor Bowling Club which meets at their new Church buildings, (corner of Harewood Road and Chapel Street ) on Wednesday evenings at 7.30pm. Opening night will be on Wednesday, 9th March. Friday afternoon bowls will continue to be held in the Papanui Hall (Frank Street). Opening afternoon will be on Friday, 11th March, at 1.30pm. New members welcomed at either sessions. Contact Kathy at the Papanui Office for further details. ‘The Lady in the Van’ Movie: Women’s fellowship are organising a block booking to this film featuring Maggie Smith, which has had excellent reviews, and is a good laugh, for Wednesday, 16 March, at 3.15pm at the Colombo, and we are inviting anyone and everyone, men included, to this. Numbers must be in no later than WEDNESDAY the 9th, to Kath Newton or Val Stammer via Leone or Kathy at the church offices asap. Parish Council Meeting: A reminder that the Parish Council will meet in the Bryndwr Hall this Wednesday, 9 March, at 7.30pm, or 7pm for a cuppa. Bryndwr Used Clothing Shop Volunteers Needed: We are looking for more volunteers to help at the clothing shop on a Saturday morning from 9.15am to 12 noon. At the moment we are very short of helpers. You would be required only once every 4–6 weeks and there are always two people rostered on together. Helpers sort through any clothing that has come in through the week and attend to customers. If you are able to help please contact Leone at the Bryndwr Office. Culture Galore: Everyone is welcome to join in for this free celebration of culture, showcasing performing arts, crafts, demonstrations and global food. Saturday 12 March 12noon – 4pm, Ray Blank Park, Maidstone Road. This event is supported by the Fendalton/Waimairi and Riccarton/Wigram Community Boards. Bishopdale Skate Jam: This is an opportunity for young folk to learn to skate with Skate Skool team. Free gear hire is available, along with free BBQ and best trick competition. Friday 18 March, 3.30 to 6.30pm, Bishopdale Park, Leacroft Street. This event is supported by the Fendalton/Waimairi Community Board.